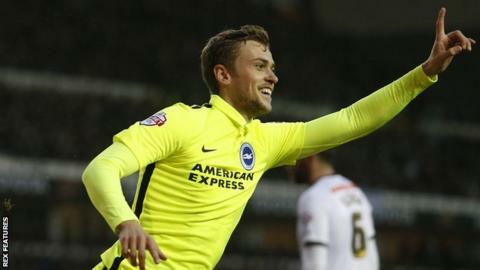 Manchester United know how well striker James Wilson is performing during his loan spell at Brighton, according to Albion boss Chris Hughton. Wilson, 20, has scored two goals in four appearances since joining the Championship side in November. "We keep them informed of his game, his physical stats and his video clips," Hughton told BBC Sussex. "That is all sent through to Manchester United. They are aware of what he has done on a daily basis." Wilson made his first-team debut for the Premier League club in May 2014 but has only featured twice for the Red Devils this season. The England Under-21 international is set to be with Brighton until the end of the season but United boss Louis van Gaal has the option of recalling him to Old Trafford. "We know there is a recall but he is here for a reason; to play games and get experience," Hughton added. "We can only take it at that value. We are very grateful to Manchester United for their interest in him coming here in the first place." Meanwhile, Hughton says the Seagulls are considering extending the loan spell of Rajiv van La Parra after fellow winger Solly March suffered a season-ending knee injury. Van La Parra, 24, has scored two goals in three games since his switch from Wolves and is currently due to remain at the Amex Stadium until 2 January. "We haven't had any contact with Wolves," Hughton, 57, said. "Initially the loan period was short-term. That is one we will assess over the next few days and take it from there. "He has been excellent, with one assist and two goals. Sometimes you bring in a loan signing and they contribute not so much - you generally never know. "With the Solly situation, it has forced our hand a bit."